It is a very old hotel but maintaining very well. View from hotel is amazing. Staff was very professional and nice at all times. Coren checked us in, she was very professional and fast. Hotel was very busy(sold out weekend). Many activities to do, multiple eating choices, cheap parking for quest, and convenient. 7min drive to casinos & boardwalk and the hotel provides shuttle bus with multiple times for drop off or pick up everyday. I really enjoyed the different activities available. I wasn’t too pleased with dinner at the grill or the service from the staff who took the call Sunday morning. It was awesome and we enjoyed our stay. And we will be back. Big room, super clean! Very quiet. Great location. Room was a little chilly. Parking garage got full after hours had to park across street almost got blocked in. Other than that a perfect evening at the Flag ship. Definitely will come back. The hotels in a great location to get away from the crowds and relax and enjoy a hotel stay with a beautiful view and a balcony . I enjoyed using the pool and jacuzzi and the tasty meal in the restaurant. Large room with a kitchen so you can feel right at home. My family truly feel we are on vacation overlooking the the ocean while we ate out on the balcony. The indoor pool was great for the kids with a spacious sun deck for us. The boardwalk is right in front of the hotel and the beach is only 15 min walk. There's a shuttle that take you to the outlet shopping and the casinos. If you want to be in the center of all the actions and casinos then look elsewhere. But you will have to pay a lot more too. The only cons of this hotel is that you are at the end of the boardwalk and there's really no shops or restaurants to walk to. But for the price it's a great value. It was decent. I do not have any complaints. It was a little far from the attractions on the boardwalk. Needs remodeling. +Beautiful view.Hotel was clean.Bed comfortable. - Didn’t understand if the WiFi was free or not.Bath didn’t have a vent so when you use it.Had to buy a air freshener to spray when finished using and keep bathroom door close. I loved the room! My two friends and myself shared a room with a great balcony and view of the ocean. All for a great price too which really makes this location perfect. Hotel needs a total renovation. The staff are not professional nor they look professional. Dirt everywhere. Pool looks like a community pool . Won’t be coming back to this place. 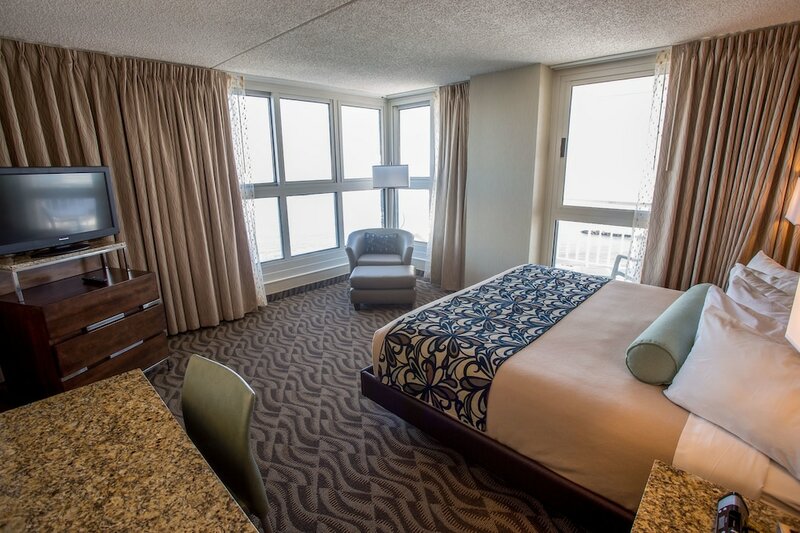 Flagship All-Suites, a fantaSea Resort places you next to Atlantic City Boardwalk and within a 10-minute stroll of other popular attractions like Atlantic City Beach. This 220-room, 3.5-star condo resort has a restaurant along with conveniences like an indoor pool and free in-room WiFi. Enjoy a bite to eat at the condominium resort's restaurant, or relax with a drink at the bar/lounge. You can sip a beverage at the coffee shop/café. For your convenience, a cooked-to-order breakfast is served for a fee each morning from 8 AM to 11 AM. Each condo is air-conditioned and features a kitchenette and a balcony. Guests can expect to find free WiFi and 42-inch a plasma TV with cable channels and a DVD player. The bathroom offers hair dryers and free toiletries. Other standard amenities include a coffee maker, a phone, and an ironing board. Guests staying at Flagship All-Suites, a fantaSea Resort enjoy an indoor pool, a fitness center, and free WiFi in public areas. Self parking is offered for USD 7.49 per night. The front desk has multilingual staff on hand 24/7 to help with dry cleaning/laundry, concierge services, and securing valuables. Additional amenities include a computer station, an arcade/game room, and express check-out. Thank you for your feedback and comment. It's greatly appreciated and I will share with the staff as they love reading these feedbacks. Please come again soon. Thank you for the feedback it's greatly appreciated. I am glad you enjoyed your stay. Thank you for the comment. Please come back soon. Thank you for your feedback and will be shared with the staff. Cooked-to-order breakfast is served daily from 8 AM to 11 AM for a fee. Blue Water Grille - Ocean-view restaurant and bar specializing in American cuisine. Open for breakfast, lunch, and dinner. Recreation features at Flagship All-Suites, a fantaSea Resort include an indoor pool and a fitness center. The preferred airport is Atlantic City, NJ (ACY-Atlantic City Intl. ): 25-min drive, 13.4 mi/21.6 km. The following credit cards are accepted: American Express, Discover, Mastercard, and Visa. The condo resort can refuse certain bookings for the purpose of group events or parties, which include pre-wedding stag/bachelor and hen/bachelorette parties. Some facilities may be restricted. For more details, contact the property. Contact information can be found on your booking confirmation. No rollaway or extra beds are available. 'seas The Moment' Luxurious Beachfront Mansion! Spectacular Views Guaranteed!